Here we go again, calling you to share with me a pleasant diner. This time let's have a sweet & sour taste of Thai cuisine. Let's see what it is about: A typical Thai meal includes four main seasonings: salty, sweet, sour, and spicy. Indeed, most Thai dishes are not considered satisfying unless they combine all four tastes. After the meal is over, there is no such thing as dispensing with leftovers. Throwing food away enrages the Thai “god of rice”, a female deity who watches over the people, ensuring everyone has enough to eat. Bad luck or even widespread famine may then ensue. In Thailand, food forms a central part of any social occasions—and vice versa. That is, food often becomes the social occasion in itself or reason to celebrate. This is partly due to the friendly, social nature of Thai people, but also because of the way in which food is ordered and eaten in Thailand. 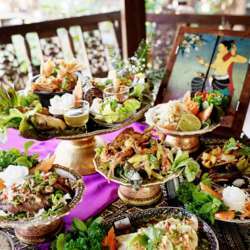 The formal presentation of food is another important aspect of Thai culture. Developed primarily in the palace to please the King of Siam, Thai food presentation is among the most exquisite in the world. Serving platters are decorated with all variety of carved vegetables and fruits into flowers and other pieces of beauty. Palace-style stir-fries include elegantly carved vegetables within the dish itself. For such artwork, Thai chefs use a simple paring knife and ice water. Tempted?? Then go for it & join with ease & joy.